If you missed the race, check out the streaming list. All of the replays can be found there. Special thanks to everyone who streamed. It was a long race that produced some of the best battles I’ve ever seen. We lost a few people along the way, in true vintage racing fashion, but endurance racing is not without its casualties. Here are the results by class, as well as a picture of the car used by each driver. Special thanks to Alphalead15 for organizing the results sheet. Sorry to blunion05 and bananapieking9, as your cars would not show up in the replays. Here are some more photos from the race. If you have any pictures from the race that you want to share, post them in the comments. Special thanks to cthom14 and Plankton (aka WELL DONE BAKU) for supplying some of the photos, and drivebyhater and Rudi SRT4 for supplying Lobby 2 replays. For his 1st place finish in the Sports - Proto class and the overall race standings for the second year in a row, the trophy for 1st place is awarded to SrPhloofy! And for my 1st place finish in the GT class, the trophy for 1st place in GT is presented to me! Since there were two lobbies run this year, the class winners from Lobby 2 will also receive trophies. For his 1st place finish in the Sports - Proto class in Lobby 2, the trophy for 1st place is awarded to Sarstan237! And for his 1st place finish in the GT class in Lobby 2, the trophy for 1st place in GT is presented to drivebyhater! 32 people. Thirty. Two. People! 2 lobbies! This is the biggest race in Forza that has ever been run on Oppositelock, to my knowledge. It’s also the first time I’ve ever had to coordinate two lobbies (special thanks to kiwichris1709 for hosting Lobby 2), so considering that I think it went pretty smoothly. Despite the delays caused by crashes and server issues from Turn 10's masterpiece of a game. But once the race started, oh my. The racing I saw at Daytona was some of the closest and most intense I’ve ever seen. Battles lasted anywhere from 45 minutes to the whole race. 1st through 3rd in GT in Lobby 1 finished 100 ft apart! If we can keep these numbers and this type of racing up all season, this will be a truly fantastic series. However, with intense racing comes incidents. 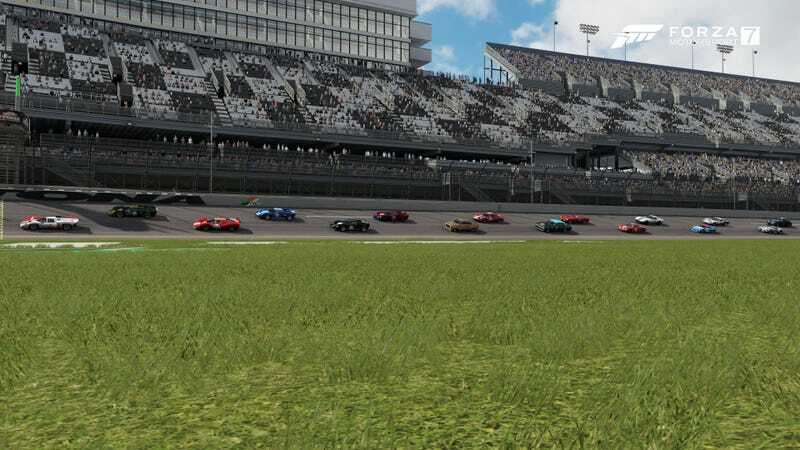 There were some questionable multi-class overtaking maneuvers, an issue where someone overtook the whole field under caution, and a poor call on my part in regards to something that absolutely should have been a caution. For a race this large and long, I expected some issues, and the fact that there were issues isn’t exactly the end of the world. Mistakes happen. But I’m hoping to avoid some of this going forward. I don’t like people’s races being hampered, especially when I cause it. Since we’re one race in now, though, I have no doubt that everything will go smoother since we’re all acquainted with the cars and racing against each other now. Now, onto the next race. Watkins Glen! The voting thread for the date will be up within the next few days, and I’ll try to give as many options as possible for dates and times again. Also, there is a very good chance that the build rules will change for the next round. All of the big-engined cars could really stretch their legs at Daytona and the buzzboxes needed a lot of power to keep up. Now that we’re moving on to normal tracks, I’m expecting that they’ll be a bit too fast now. Expect a major shake up in BoP, potentially even in Sports-Proto. After this though, I think BoP will remain relatively unchanged until Le Mans. New BoP should be done at least a week before the next race. I’ll keep you all posted. What a way to kick off this series. Congrats to everyone who raced, regardless of position. This was a hard fought race, and I cannot wait for the next round!